Yep, I'm a lucky gal. 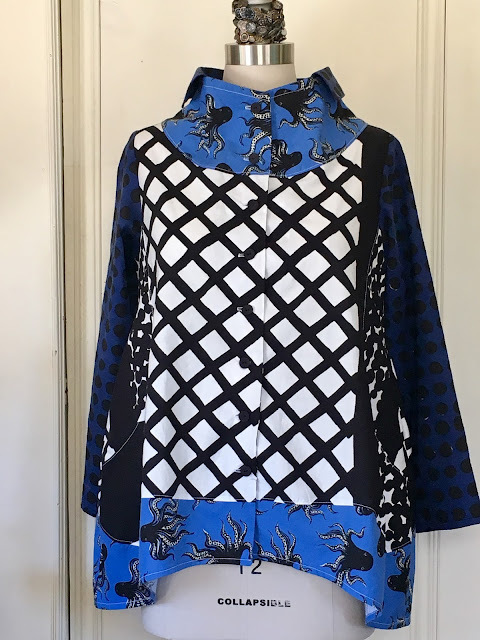 It's a Butterick Katherine top, just in case you start looking for it! fun to follow your travels. and the mix of fabricsmin your top is dazzling and just fun. Thanks Martha. I've been missing you at DOL's. We seem to go to different ones. I hope we'll hit the same one some day! Eating, sewing (and I'm guessing wine) what else do you need! What an amazing summer you have been having! thanks for sharing it. How did you know there was wine involved? I think they all thought we were the weird California contingency when we brought our bottle into the dining room every night! Thanks for dropping by! Wish I'd been on that workshop with you. Looks amazing. Your Katharine Tilton shirt is stunning. A great choice of fabrics. Your pattern matching on the front is fearless. Well done. Brava. It always gives pause to try those pattern matches. Sometimes they actually work out. Thanks! I took an indigo workshop with Dorothy in Halifax (Nova Scotia School of Art and Design) 20 years ago. She is wonderful! What a wonderful summer. She's not only a wonderful human being, she's one terrific teacher! As an art teacher I still use the language of "mark making" that she introduced me to. You'r so wise. At first it sounds confusing but once you understand it's meaning and start using the term it makes all the sense in the world!